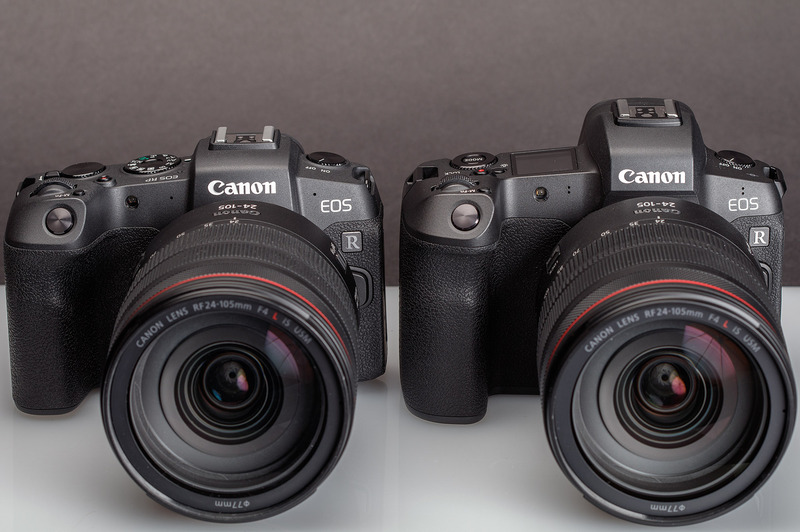 The EOS RP really is impressively small - smaller than many of Canon's own DSLRs that have smaller APS-C sensors. Despite this, Canon has made sure the controls aren't cramped, the grip is comfortable, and both the viewfinder and screen are nice and big. 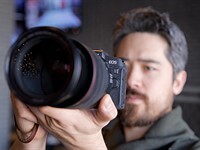 Compared to the existing EOS R, the RP is a bit more 'squat' and significantly slimmed down; against other full-frame interchangeable lens cameras, only Sony's original a7 is lighter. Despite its light weight, the RP's polycarbonate-on-mag alloy chassis build feels reassuringly solid, with no creaks or obvious signs of cost-cutting in its build. It's at a price point where we wouldn't expect weather-sealing, but at least the RF lenses we've seen so far have a gasket to keep dust and moisture ingress around the mount. 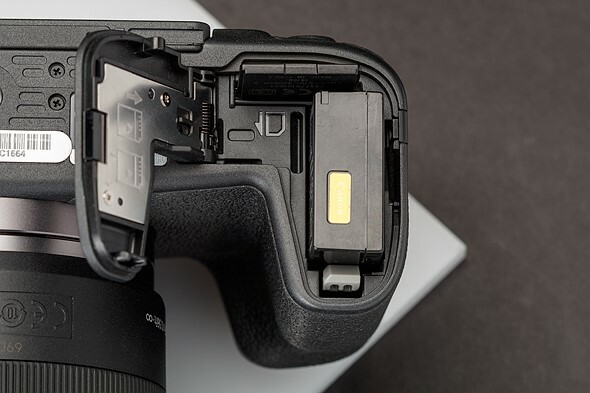 The grip on the RP is quite comfortable (though your pinky finger may hang off the bottom), and it may not be comfortable for use with larger lenses - the optional grip extender will help here. 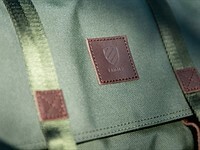 It must be said that, at the time of this writing, only one native lens - the RF 35mm F1.8 Macro - balances well on the EOS RP. And, to be honest, most of us on staff would have welcomed a fractionally larger grip that could have also accommodated a larger battery. 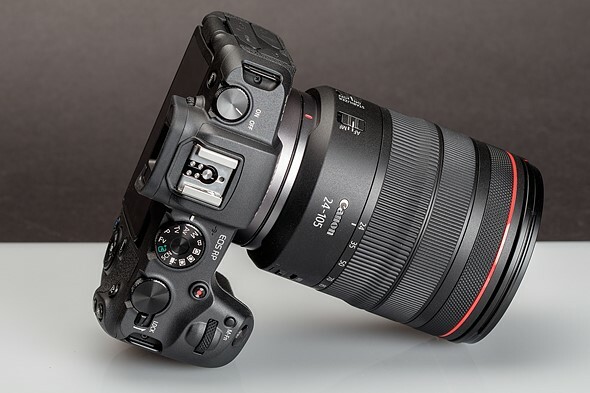 The RF 24-105mm F4L IS USM will work in a pinch, but is still a bit unwieldy. 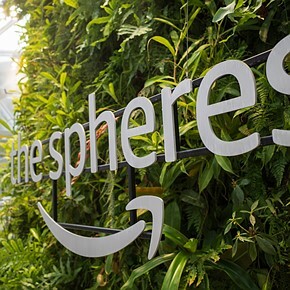 We're looking forward to more lenses like the RF 24-240mm F4-6.3 for use on the EOS RP - they're not really 'exciting' lenses in terms of their specifications, but are likely to be much more appropriate for a camera of this type and price. Adapted lenses like the EF 40mm F2.8 pancake and 50mm F1.8 STM also balance well on the RP. 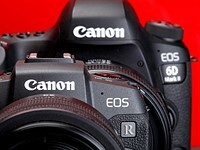 Though the EOS RP is a fairly entry-level offering, its connectivity options are - for the most - full-featured. 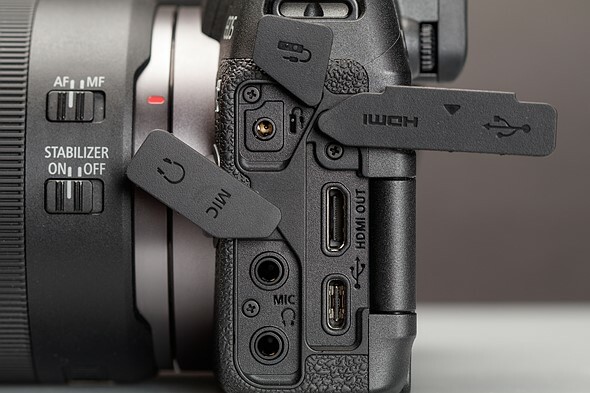 You get HDMI out (supporting specialty video output which we'll cover later on), a microphone jack as well as a headphone jack for better audio to go with your video, and a remote jack. The only questionable choice here is the USB-C port. It's a modern port and does allow USB charging, but it also only supports USB 2.0 transfer speeds - we didn't even know that was possible with current USB standards. The controls on the EOS RP are, on the whole, rather well implemented. 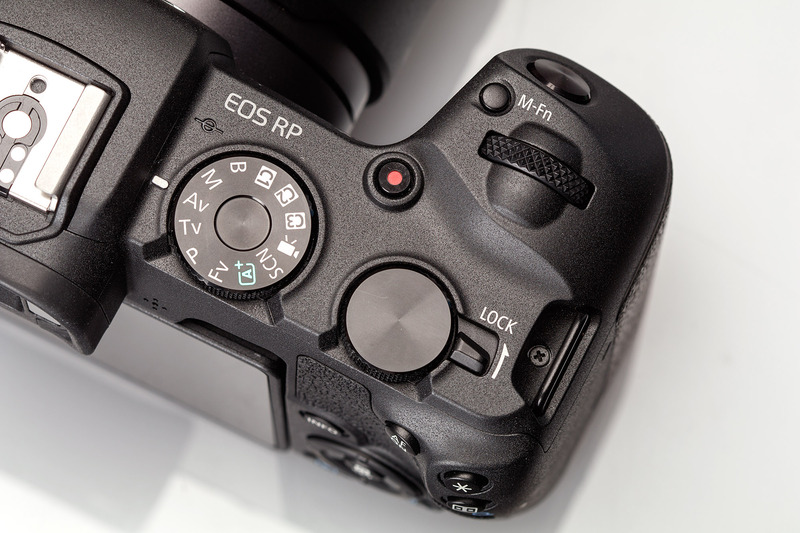 The controversial M-Fn touch bar from the EOS R is gone (good riddance), and the rear control dial on the shoulder of the RP is more pronounced and easier to use than on the R. The AF-ON button is easily accessible for back-button autofocus users, though we continue to find that the left shoulder of the camera could perhaps provide greater utility than simply one large On-Off switch. Customization options are typical Canon, giving you plenty of flexibility with some buttons but with arbitrary limitations for some of the others. If you want to use the four-way controller for AF point placement instead of the touchscreen, there's still no option to make your chosen AF area move faster, which we would really like to see on this and the R.
The rear screen itself provides an excellent and responsive touchscreen experience, and the electronic viewfinder, though lower-resolution than the R, still provides excellent color and contrast thanks to its OLED panel. 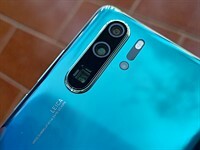 One gripe is that, when the rear screen is flipped out, the eye sensor doesn't disable - if you move the camera too close to your body while shooting from the hip, you may deactivate the screen and miss a shot. For those that like to use Auto ISO, the EOS RP has a fantastic implementation that gives you control over your chosen range of ISO values, a minimum shutter speed, and an option to have the camera choose that minimum shutter speed automatically. If you choose the last option, you can bias it either faster or slower than the default option, which is 1/focal length. The EOS RP includes Wi-Fi and Bluetooth LE, with setup being fairly straightforward and feature support being robust. With Canon's Camera Connect app, you can browse and download images on the camera, control the camera remotely and tag your images with GPS data from your smart device. 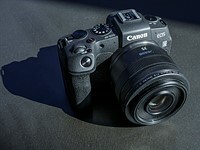 The EOS RP makes use of Canon's LP-E17 battery pack, which also powers a fair number of Rebels and EOS M-series cameras. Of course, in the RP, it's driving a larger, more power-hungry sensor - hence the rather unimpressive 250 shot rating from CIPA. That's pretty low by modern standards: if you're taking the occasional shot here and there, it'll may stretch to a couple of days' shooting but if you're focused on photography, expect to need a second battery or to have to constantly think about re-charging. The EOS RP is also a bit picky about USB charging as well. A modern Macbook charger works just fine, but you may find that some smaller wall adapters, such as those for smartphones, won't provide enough juice to get the RP to charge. 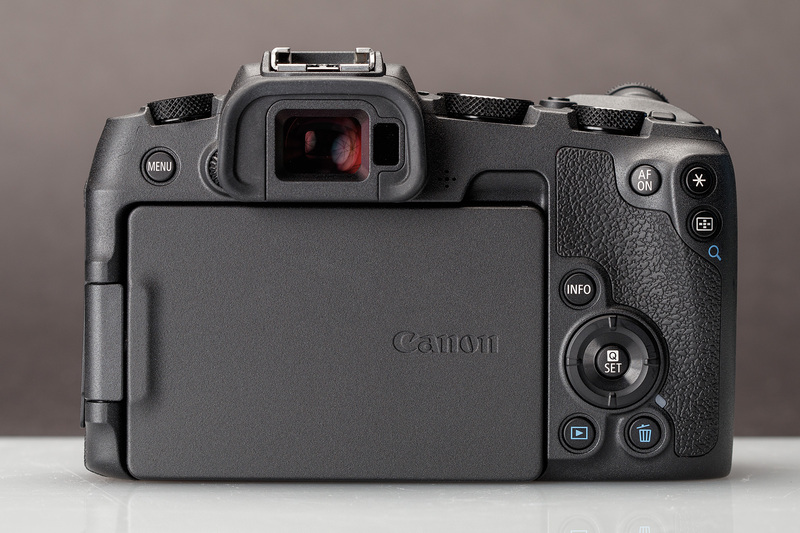 Lastly, the EOS RP uses a single, standard UHS-I memory card slot. Given the rather pedestrian maximum burst speed coupled with a surprisingly deep buffer, we haven't experienced any issues with file write times in our time with the camera. Are the usual derogatory comments just garden variety trolls or are the other companies paying these people to do it? I'm not familiar with the Canon brand nor its model coding. My first thought was if this was mirrorless. Not even in the "Key specifications" is this mentioned. Curious that! 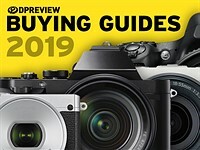 Has mirrorless now been accepted as no longer exotic but just another technical feature of mainstream cameras? Still, surely the absence of a mirror should have been mentioned in the specification if for no other reason than to warn the reader that an adaptor may be needed. The RP, whether people like it or hate it, is certainly arousing huge interest! I think we have had 2700 comments already before. zxaar - what subject were those comments about? I forgot but if i am right then it was fuji article. So you are going to buy it? The cameras with best image quality are only available from Trolls 'R' Us. The ultimate value of a camera is the quality of the person using it. IQ seems to be a poor primary criteria in a time when pretty much all ILCs, including the RP, produce IQ capable of being printed at 24" x 36" with very little grain/noise vs. 645 film or sensors from just 5 years ago. Gallery-caliber IQ. You can split hairs on sensor tech, but that won't stop good photographers from creating gorgeous images, even selling them in galleries for thousands of dollars per print, with M43, APS-C, D700, or this RP. That said, for street, action, or changing/dynamic shooting situations ergonomics really matter. And that, for me anyway, is by far the RP's greatest shortcoming. It migh be nice if DPReview could add numerical values to the bar showing RAW and JPG image quality in their "Conclusions" graphic. The bar measuring image quality of this camera, is far shorter than it is for most all other full frame cameras, therefore, my initial comment stands. No trolling whatsoever - simply honest comment on objective data as presented. I understand what you're saying. And from a technical standpoint, you're absolutely correct. But "poor" performance by today's standards is truly just a lower degree of genuinely very good. 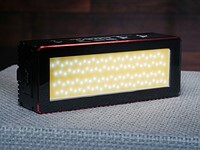 Unless you really really need to lift shadows, this sensor is just fine. 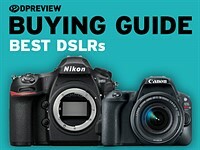 Nikon D7200 has better sensor D500. D7200's DR is equal to Sony A7III in DxOMark. Is D7200 a better camera? 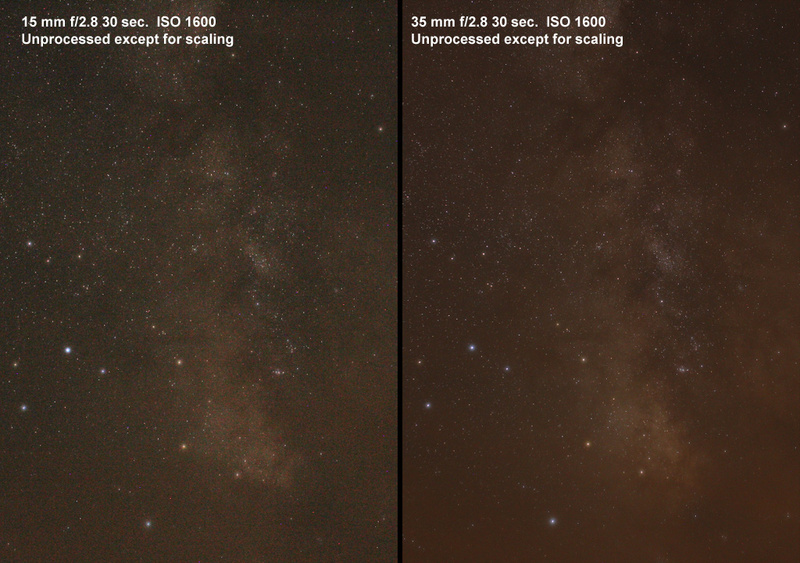 Nikon D810's sensor is better than Nikon D5 up to like ISO6400. Is D810 better? It is also quite a bit cheaper. Similarly Canon 5DIV's sensor is better than 1DX II up to ISO12800. Is 5DIV better than 1DX II? Nikon D3300's DR is way better than Nikon D5's. Is D3300 a better camera? 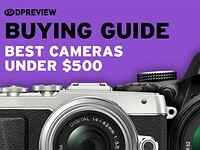 This is not really objective data, it's DPR's somewhat confusing rating system, and I believe it is not directly comparable to other categories of camera. The RP is in it's own category. 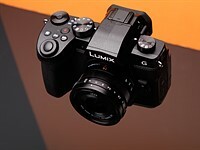 For example select the RP and also the 5D Mark II and observe that the raw image quality rating is much better for the 5D Mark II, despite the sensor performance being worse. dpr4bb - I think the problems related to the electronic level have already been fixed in the latest firmware for the EOS-R, so I'd expect it to be available very soon for the RP. @entoman Unfortunately they have not. There is a thread about this in the forums. I doubt they will ever get fixed. dpr4bb - Firmware version 1.2.0., which Canon claim will fix the electronic level issues, was only released yesterday. Have you tried it and found that it doesn't do what they say it does? dpr4bb - The link you posted above doesn't seem to mention anything about the electronic level. It's all related to "zooming". Could you clarify? @entoman Read the thread, please. The link I posted is to the reply from someone (who applied the new firmware) to my question about the behavior of the electronic level with the new firmware. It shows that with the new firmware, the electronic level still disappears when face-/eye-detect AF is enabled!?! The problem has *not* been fixed with the new firmware. 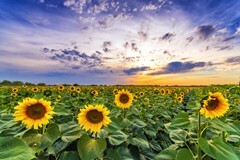 In the example above, this is a situation where the distance between the camera and the subject is the same for both pictures (infinity). 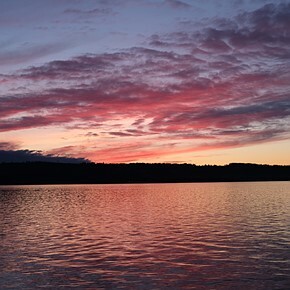 It means that, if the picture on the right, taken at 35mm, covers the whole sensor, the picture on the left, taken with the 15mm, has been cropped and enlarged to show the subject at the same size. It means that less photons were collected, resulting in a noisier (and less detailed) image. When DPR testers took pictures of their studio scene with the RP+50mm F5.6 and 6D+85mm F5.6, they changed the camera/target distance so that the target covers the whole sensor. So the number of collected photons is the same for both cameras. This is not a problem to use different focal lengths as long as the same aperture is used AND the camera/target distance is changed accordingly. Sony-Northrup = Loser troll of the year? What lousy unprofessional tools are you talking about? I was only referring that the RP is good enough for professional work. It is. From the perspective of its build and IQ ability. It’s more than good enough. 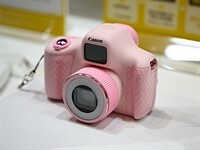 Canon make quality products. If I was starting out again. The RP would be a camera I consider for budgetary reasons. You don’t need a pro body to start. You get there. I think 2 Rp’s and a good lens for each would be a far wiser investment than a d850 and no money left for good lenses. Glass has and always will be king for a pro. 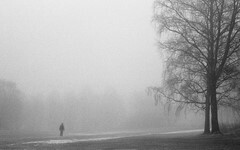 If you are so paranoid and risk averse, a photography career is not for you! As for uncle bob - It’s a hypothetical statement to make a point! get a clue. dude. Why would you think that was a literal statement? My point is the photographer takes the pictures. The hack thinks it’s the cameras job. You keep insinuating I’m cheap for some reason. No. I’m just realistic. You don’t know what you’re talking about. But I’m the guy shooting d850’s here. BTW - What kind of situation are you exactly worried about? A cat attack? 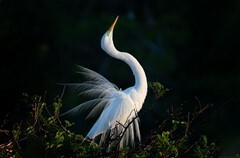 An angry bird? 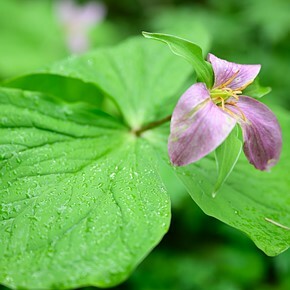 A large thump from a wild flower.. Or are you worried about dew damage from wet grass? Sorry. Silly me. I didn’t think about that over hanging tree branch suddenly falling out of nowhere and landing your camera. I’m intrigued as to what risk you have put yourself in that makes shooting the RP a stupid unprofessional risk. Or are you saving up $$ and courage for that d850 so you can start shooting weddings. I hear those brides can get pretty crazy when the sh!t hits the fan. 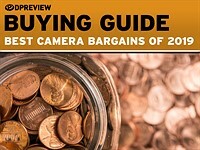 Consumer cameras fail faster and more frequently than professional or semi-professional cameras for a reason. Which is why professional tools cost more. Not because they are less crippled, like Canon's philosophy shows. When you are trying to save money by using non-professional tools, you are being unprofessional and risking your reputation. This might not apply when you are self-employed and you sell your work long after it's done. But, even then, it just might turn out to cost more in the long run, when you kill some RP's in the process, due to inadequate workloads, temperatures, humidity and physical abuse, which they can't handle. "You don’t need a pro body to start." - You don't need to buy any bodies to start, you can simply rent them. 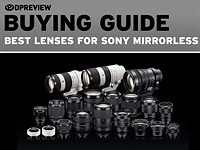 "no money left for good lenses" - So, why suddenly good lenses matter to you? Why don't you use the same logic on lenses? 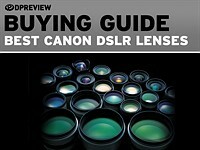 There are plenty of great optical quality consumer lenses. You must be brainwasher with "lenses-first" mantras, aren't you?